Exactly five years ago, the NBA playoffs had the same two teams duking it out for championship rings. 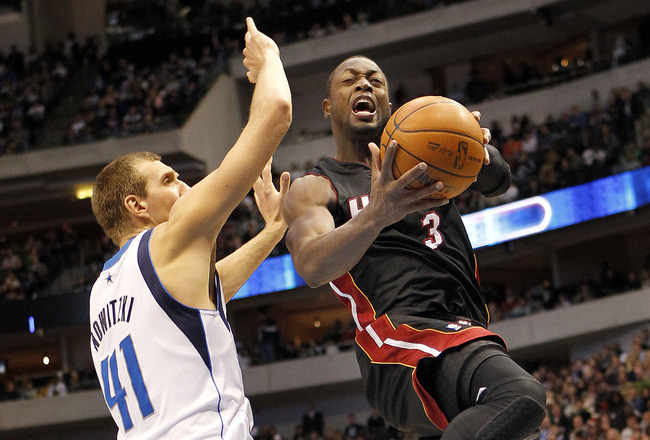 Miami Heat and Dallas Mavericks. Both teams have risen above, both achieving what they hadn’t expected, both pushing their limits. But now, it’s the Mavs chance to take back that ring they let slip out of their fingers. Dirk is getting older; he’s thirty two to be exact. And as much as I love Miami (my #2 team), I honestly believe that Dirk deserves a ring more than Wade. Dirk is probably one of the most understated players in the NBA, and it’s only until this year’s playoffs that he has really been in the spotlight. Don’t get me wrong- it’s definitely not going to be a walk in the rose garden trying to get redemption from the Heat. Overcoming Wade, Bosh, Lebron and their defense will be tough. Especially Dirk and Bosh, because Bosh has had an excellent series this year (minus against Boston, that was just a flop for him). But I know the Mavs are capable. They are so capable. I guess we’ll see, eh?